There were many inspiring young people who fought against German Nazi rule, including German college student Sophie Scholl. Sophie was a member of the White Rose, a small, anonymous group of mostly university students that distributed anti-Nazi leaflets and wrote graffiti in public spaces to inspire resistance among German intellectuals. Reading the pamphlet, Sophie was conflicted about whether to report it to Nazi authorities. She had two brothers serving in the war at the front, her father was in jail awaiting sentencing, and her mother was ill. Waiting to report anti-Nazi literature was a crime. She walked out of the lecture hall with the pamphlet in hand. Sophie went in search of her older brother Hans, who was a medical student also at the University of Munich. He wasn’t in his apartment, so she waited for him there. She found a book by the German poet Friedrich Schiller on his desk and began reading. One page in particular was covered in marks. The exact words she had read in the pamphlet were underlined. Sophie was terrified. Her brother must have had something to do with the pamphlet. When he returned, Sophie confronted him. He denied her accusations. Two of his friends arrived, and eventually they told her the truth. Her brother and four others were a part of an anonymous resistance campaign against the Nazis. Sophie decided to join them. Sophie’s brother Hans, a leader of the White Rose. For the next month, the group worked on their campaign. They bought stamps and paper from different post offices to avoid arousing suspicion. They collected quotes and copied them with a mimeograph. One of the first pamphlets read, “Since the conquest of Poland, 300,000 Jews have been murdered, a crime against human dignity.” The third called for the sabotage of armament plants, newspapers, and public ceremonies, and the awakening of the “lower classes.” Rumors buzzed about the pamphlets and their anonymous authors. As the language of the pamphlets became increasingly explicit, the Gestapo (German secret police) ramped up their efforts to find the perpetrators, arresting anyone at the slightest suspicion of collaboration. In July, four members of the White Rose including Hans were ordered to spend their summer break working as medics at the Russian front. On their way, they passed the Warsaw ghetto and were horrified by the conditions in which Jews were being held there. Once in Russia, they understood that Germany was losing to the Soviets despite the fact that the Nazis claimed that they were winning the war. When they returned home in November, they were emboldened to step up their resistance, and the White Rose increased the number of pamphlets they were publishing. The group traveled by train to distribute leaflets all over Germany. They wanted to create the impression that the White Rose was a vast network, that the public was behind them. When the Germans admitted their loss to the Soviets in February of 1943, some White Rose members went out at night and graffitied the words “Freedom,” “Down with Hitler” and “Hitler mass murder” on the city hall and other public places. They believed Nazi Germany might be crumbling, they just needed everyone else to believe it. On February 18, Sophie and Hans brought suitcases full of pamphlets to the University of Munich and left them in classrooms and hallways, and on windowsills. They — some accounts say just Sophie — went to a balcony that overlooked one of the university’s main courtyards. As hoards of students streamed out of class, the pamphlets fluttered down from the sky above them. 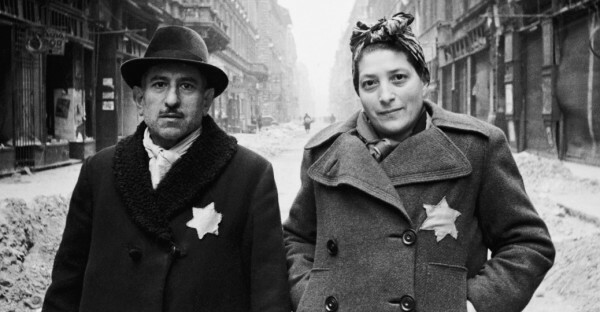 A Jewish couple after the liberation of the Budapest Jewish ghetto in 1945. After she interrupted the judge several more times, Sophie, her brother, and another member of the White Rose were sentenced to death. On the back of her indictment, Sophie scrawled the word “Freedom.” Within hours, the trio were lead to the guillotine. From the executioner’s block, her brother shouted, “Long live freedom!” In total, roughly 5,000 dissenters would be similarly executed during the Nazi regime. In the 1940s, the most effective way to get the word out about a cause was through leaflets, or, pamphlets. What would be the most effective ways to spread awareness of a cause today? Can you think of other rebel or revolutionary groups from history? How did they try to accomplish their goals? Did they succeed? Have others tried to change your mind on a belief you held or an action you were considering? Did they succeed in changing your view? Why? If not, what tactics could they have used to be more effective? Section Objective: Students will learn what the White Rose was, who Hans and Sophie Scholl were, and how their writing influenced the resistance against Nazi rule in Germany. Students will be encouraged to find contemporary application in the writings of the White Rose group. analyze, compare, and contrast multiple texts for content, intent, impact, and effectiveness. evaluate the evolving and changing role of government. Supplies: Pens, paper, copies of White Rose leaflets. Like the White Rose fighting for German freedom and expression, what are some causes you would fight for? Have you ever written or spoken about a cause that mattered to you? How did you share your thoughts and feelings about that issue? Clear space for class to be able to move and physically create in. Divide students into four groups. Each group is assigned a portion of a different White Rose Pamphlet (excerpts below). Each group should read through their assigned excerpt portion. Groups now have a sufficient amount of time to theatrically stage their excerpt. During the piece, at least three people must read from the main body of the text. There must be a moment in the performance that features the group making a unified sound. It can be a sound effect, an expression of emotion or even a full-group reading of a portion of text. Movement and bodies should be active. Everyone in the group must be a part of the piece. Groups should not have to audibly read through their entire piece in performance but look to the text as a guideline of content to cover, emotions, movements and the like to tap into. Who among us has any conception of the dimensions of shame that will befall us and our children when one day the veil has fallen from our eyes and the most horrible of crimes – crimes that infinitely outdistance every human measure – reach the light of day? If the German people are already so corrupted and spiritually crushed that they do not raise a hand, frivolously trusting in a questionable faith in lawful order of history; if they surrender man’s highest principle, that which raises him above all other God’s creatures, his free will; if they abandon the will to take decisive action and turn the wheel of history and thus subject it to their own rational decision; if they are so devoid of all individuality, have already gone so far along the road toward turning into a spiritless and cowardly mass – then, yes, they deserve their downfall. “It is impossible to engage in intellectual discourse with National Socialist Philosophy, for if there were such an entity, one would have to try by means of analysis and discussion either to prove its validity or to combat it. In actuality, however, we face a totally different situation. At its very inception this movement depended on the deception and betrayal of one’s fellow man; even at that time it was inwardly corrupt and could support itself only by constant lies. After all, Hitler states in an early edition of “his” book (a book written in the worst German I have ever read, in spite of the fact that it has been elevated to the position of the Bible in this nation of poets and thinkers): “It is unbelievable, to what extent one must betray a people in order to rule it.” If at the start this cancerous growth in the nation was not particularly noticeable, it was only because there were still enough forces at work that operated for the good, so that it was kept under control. As it grew larger, however, and finally in an ultimate spurt of growth attained ruling power, the tumour broke open, as it were, and infected the whole body. The greater part of its former opponents went into hiding. The German intellectuals fled to their cellars, there, like plants struggling in the dark, away from light and sun, gradually to choke to death. Now the end is at hand. Now it is our task to find one another again, to spread information from person to person, to keep a steady purpose, and to allow ourselves no rest until the last man is persuaded of the urgent need of his struggle against this system. When thus a wave of unrest goes through the land, when “it is in the air,” when many join the cause, then in a great final effort this system can be shaken off. After all, an end in terror is preferable to terror without end. The third leaflet of the German anti-Nazi group the White Rose, produced at some point between 1942 and early 1943. “Sabotage in armament plants and war industries, sabotage at all gatherings, rallies, public ceremonies, and organisations of the National Socialist Party. Obstruction of the smooth functioning of the war machine … Sabotage in all the areas of science and scholarship which further the continuation of the war – whether in universities, technical schools, laboratories, research institutes, or technical bureaus… Salus publica suprema lex. All ideal forms of government are utopias. A state cannot be constructed on a purely theoretical basis; rather, it must grow and ripen in the way an individual human being matures. But we must not forget that at the starting point of every civilisation the state was already there in rudimentary form. The family is as old as man himself, and out of this initial bond man, endowed with reason, created for himself a state founded on justice, whose highest law was the common good. The state should exist as a parallel to the divine order, and the highest of all utopias, the civitas dei, is the model which in the end it should approximate. Here we will not pass judgment on the many possible forms of the state – democracy, constitutional monarchy, and so on. But one matter needs to be brought out clearly and unambiguously. Every individual human being has a claim to a useful and just state, a state which secures freedom of the individual as well as the good of the whole. For, according to God’s will, man is intended to pursue his natural goal, his earthly happiness, in self-reliance and self-chosen activity, freely and independently within the community of life and work of the nation. The sixth and final leaflet of the German anti-Nazi group the White Rose, produced in February 1943. 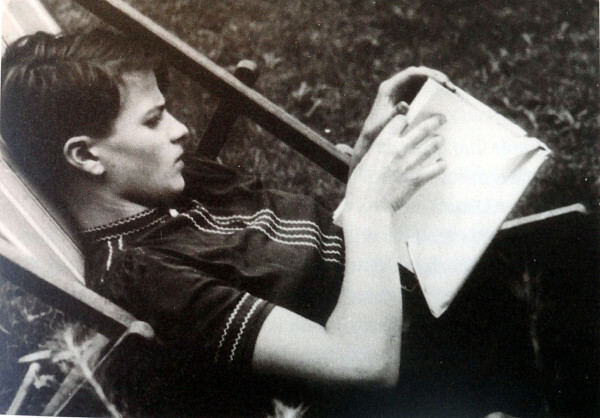 White Rose founder member Sophie Scholl was spotted by a Nazi Party member distributing them at the Munich University. The remainder of the group was then rounded up, its leaders beheaded and supporters jailed. “Fellow Fighters in the Resistance!